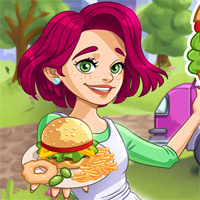 Play Burger Truck Frenzy USA! Cook burgers to satisfy your customers appetites, and make sure you are fast. You will need to quickly gather ingredients, follow burger recipes, and collect coins for each completed order. Happy customers will give you more coins, but unhappy ones will leave! Can you complete all 30 stages and become the food truck champion?